Proposed apartment at 10 Wilby Crescent. Staff be directed to schedule a community consultation meeting for the lands at 10 Wilby Crescent together with the Ward Councillor. Notice for the community consultation meeting be given to landowners and residents within 120 metres of the site. 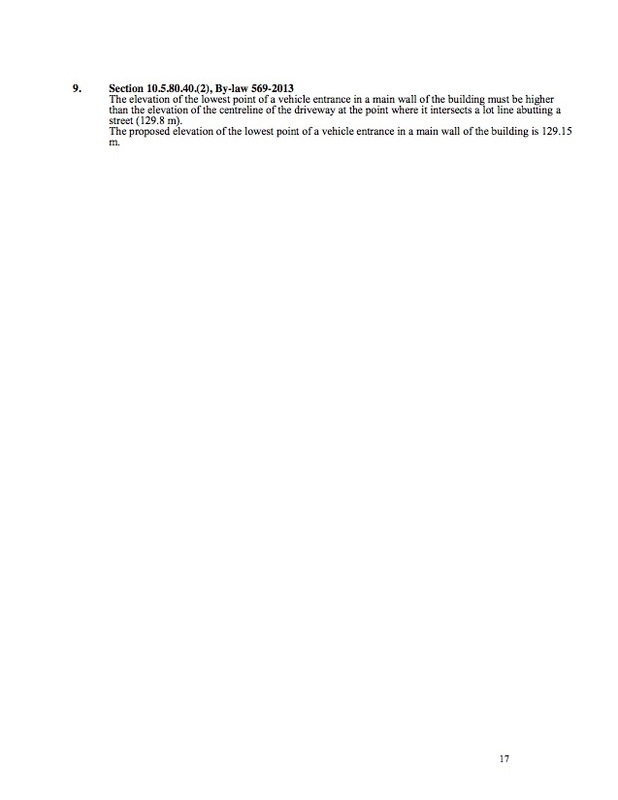 Notice for the public meeting under the Planning Act be given according to the regulations of the Planning Act. Approve the application to demolish the two storey industrial building without entering into a beautification agreement with the City and the appropriate City officials be authorized and directed to take the necessary action to give effect thereto. 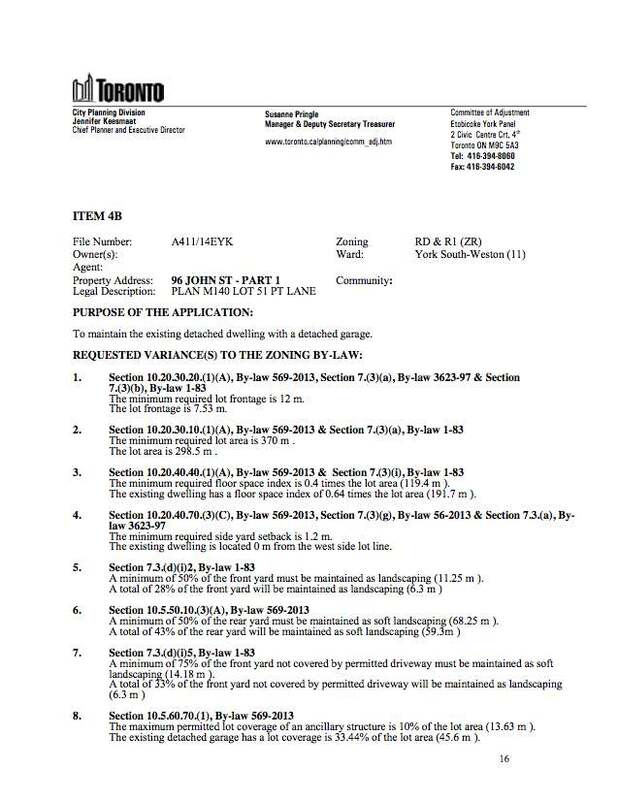 Update: The minutes don’t give details of the amendment yet, however, InsideToronto says that Councillor Nunziata asked for a heritage report on the building that will be delivered at the April EYC meeting. Etobicoke York Community Council NOT approve the installation of all-way stop controls at the intersection of Rosemount Avenue and MacDonald Avenue. Etobicoke York Community Council NOT approve installing fencing across the laneway between MacDonald Avenue and Lawrence Avenue West, east of Ralph Street in order to block access to pedestrians. 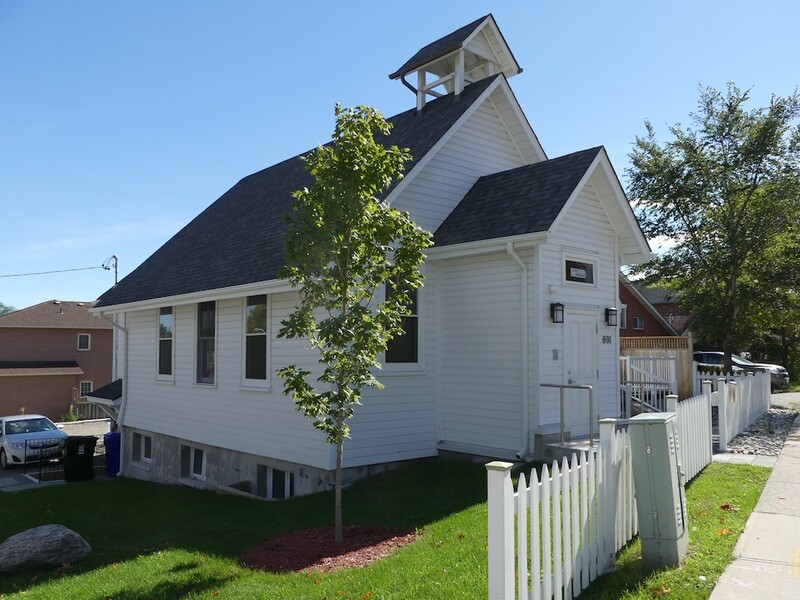 Weston Treasures – Toronto Bell Cote. The former St. Matthias church newly renovated. There is a small white church on Scarlett Road (in Greater Metropolitan Weston) that featured large in the aftermath of Hurricane Hazel. Then named St. Matthias Anglican, (the congregation relocated in 1957) it became a centre for community donations to assist victims of the disaster that killed and rendered homeless many people in the area. Even without that role, it has a fascinating history having been built in Malton in 1895 and was moved to its current location on Scarlett Road in 1923. Eighty years later, in 2003, the site was given Hertitage Site designation by the city thanks to the hard work of local historical societies. 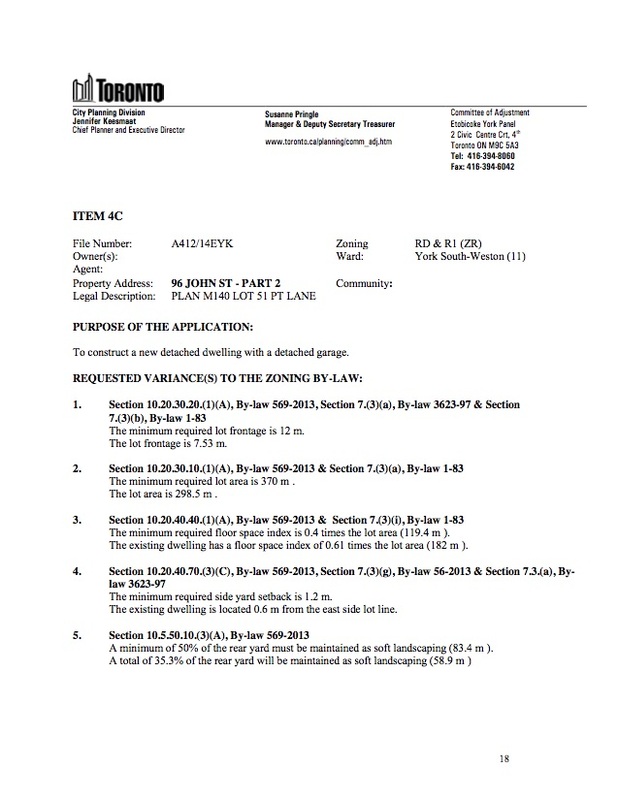 An application to have the site redeveloped as a townhouse complex came in 2004 but the City and then the OMB said no (demonstrating the worth of a heritage designation). Details of its condition can be found here. City planners recommended against demolition, and mercifully, Etobicoke York Council unanimously voted against the application. The group was told by then Councillor Doug Hoiyday to have a re-think and look around for grant money which they did – very successfully – and the rest is history so to speak. 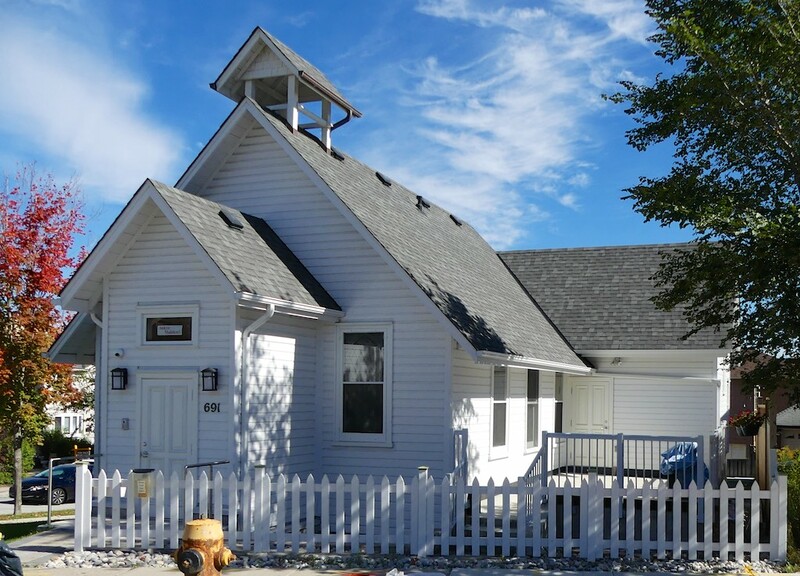 The costly renovation that has been done is very sympathetic and has ensured many more years of existence for the 120 year-old building and the preservation of a local landmark. The installation of a geothermal heating and cooling system will ensure low running costs for many years to come. The Sukyo Mahikari organization has only one location in Toronto and this is it. The sympathetic addition can be seen on the right. The church is still working on further restoration and a major project will be to replace the bell that went missing a few years ago. If readers would like to have a tour, one may be arranged by phoning 647-748-2683. Hickory Tree Road on a typical afternoon looking towards Lawrence Avenue West. Torontonians have a love-hate relationship with speed bumps. In their own neighbourhood they are life-saving, civilization-restoring child-protecting humanitarian structures. In other parts of the city, they slow down emergency vehicles and are a shock absorber-destroying menace that keep people from getting home to their families. They bring traffic to a crawl and because of this, allegedly reduce accidents and injuries. There is a political process for the installation of these traffic calming devices and part of that consists of a residents’ survey to determine if the bumps are actually desired by a majority. The ball started rolling on this project in 2007 but nothing much seemed to happen until this year for some reason. Eventually, a survey was held last September and tellingly, the issue wasn’t deemed important enough by residents for a majority of them to make the effort to respond. In fact, out of 378 eligible voters, 55 stalwart citizens mustered the indignation needed to participate: 52 voted in favour, one was opposed and two people were somehow able to spoil their ballots. So the project was doomed to fail you might think. Not so. Mathematical wizards at City Hall turned these dismal polling numbers into a positive by saying that even though the threshold of 50% of resident participation wasn’t met, 94% of those voting actually wanted speed bumps. In the real world though, there’s no disguising the dismal reality that only 14% of affected residents were sufficiently motivated to vote for speed bumps. 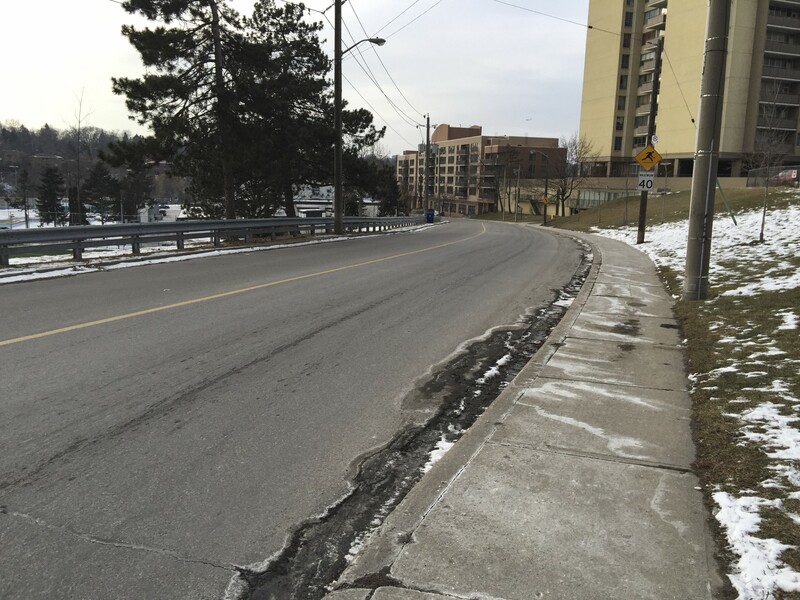 As is often the case, regardless of the rules and the survey’s validity, our fearless leaders at Etobicoke York Community Council consistently propose and vote in favour of speed bumps regardless of the process. In spite of Transportation Services recommending no speed bumps on Hickory Tree Road, Councillor Nunziata and her colleagues didn’t fail to disappoint. Cost to the taxpayer: $12,000. Plans are here. Democracy at work; gotta love it. Author Roy MurrayPosted on January 15, 2015 January 15, 2015 Categories Opinion, Traffic, Weird and WackyTags Etobicoke York Community Council, Frances Nunziata, Hickory Tree Road, weston1 Comment on Speed bumps to nowhere. 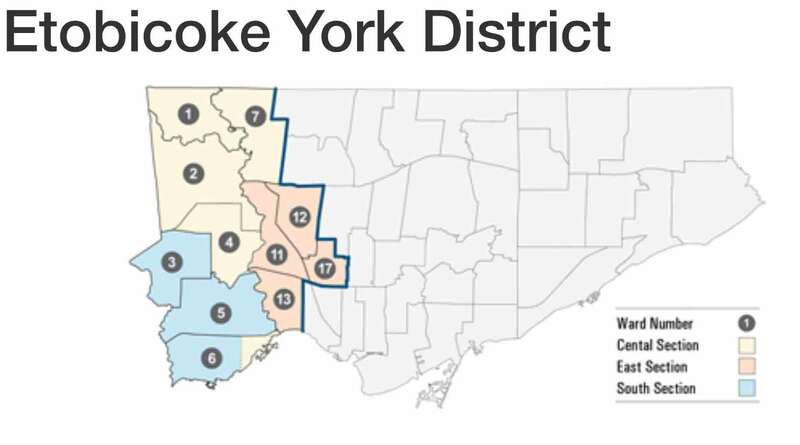 The applicants will be making their case before the committee of adjustment this Thursday at 1:00 pm at the York Civic Centre, 2700 Eglinton Avenue West. Etobicoke York Community Council overruled city staff and residents to be surveyed to see if they want speed humps on Wendell south of Oak/Gary. The humps may yet hit a bump: more than half of surveyed residents will have to respond to the survey, and 60% of respondents will have to approve of them.